Have you ever met a community helper who wasn’t needed to help your neighborhood, school, or city run smoothly? We all have a job to do and every job serves a purpose. Community helpers come in all shapes and sizes and they’re all around us. Why not invite a local fireman, librarian, or doctor to come to your classroom and share with your kids what their job is like, who they help, and how they serve their community? You will find that some of your student’s parents would love to come and share about their jobs, if you just asked! Have them bring their gear, too. Maybe a doctor could listen to a heartbeat, a fireman put his helmet on a student’s head, or a mechanic show the kids how to use some tools. The kids love seeing (though maybe not handling) all the cool stuff grown ups work with every day. 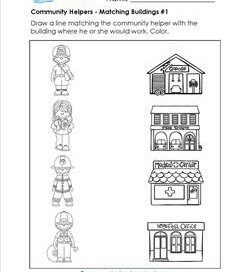 In this worksheet kids draw a line from the mail carrier to the post office, nurse to the medical center, fireman to the fire station, & mechanic to the garage. 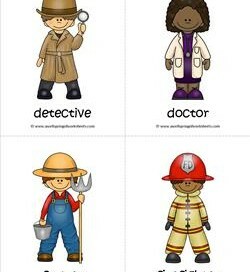 Match ’em up by drawing a line from the waitress to the restaurant, policeman to the police station, doctor to the hospital, & teacher to the school. 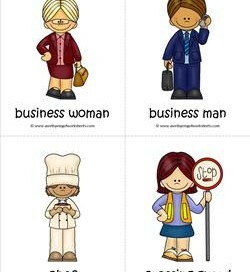 Match these people: the businessman to the businesswoman, fireman to the policeman, teacher to the crossing guard, and the nurse to the doctor. 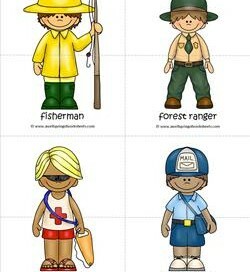 Match the objects to the 4 community helpers: the teacher to the apple, the vet to the dog, the fisherman to the fish and the forest ranger to the tree. This matching is fun! 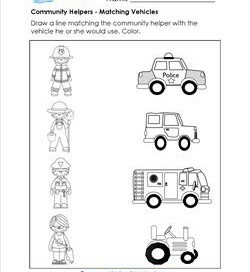 Match the fireman to the firetruck, the farmer to the tractor, the policeman to the police car, and the lifeguard to the jeep. 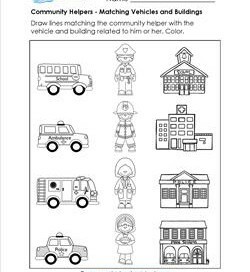 This community helpers worksheet has double matching! 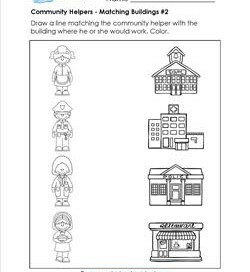 Match each community helper to both a place of work and a vehicle. 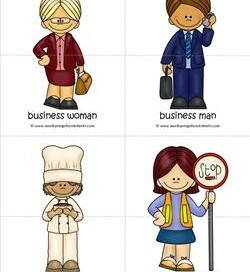 Match the parts of these workers in your community: a business woman, a business man, a chef, and a crossing guard. Do you recognize the folks in these occupations? A detective, a doctor, a farmer, and a firefighter? What jobs do they do? 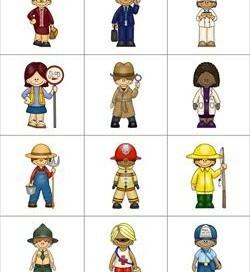 Which of these workers do you see almost every day or just once in a while? 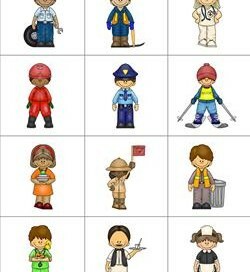 These workers are a fisherman, a forest ranger, a lifeguard, and a mail carrier. 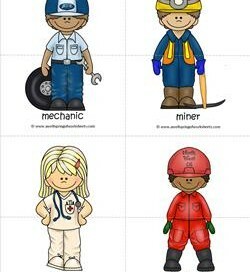 Kids have probably met a nurse and a mechanic, but what about a miner and an oil worker? What jobs do each of them do? What tools do they use? What jobs do these folks do? 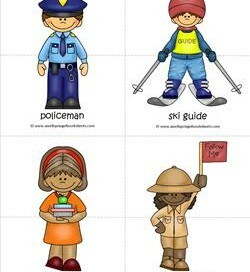 Kids can most likely describe what a policeman and teacher do, but what about a ski guide (or instructor) and a tour guide? These are workers in your community. Do recognize them when you are out and about? 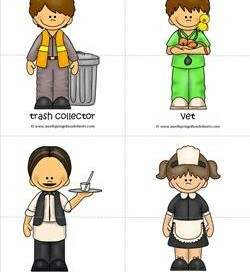 A trash collector, a vet, a waiter, and a waitress. 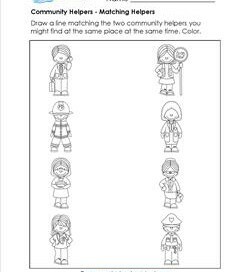 This reference page is meant to show kids what the helpers look like in one piece! Use it with the game or for other purposes. 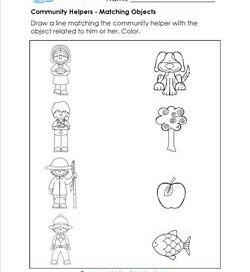 This is the second reference page for the matching puzzles. Kids just might want to know who the characters are they are matching together!